Average canner makes about 8-12 jars of pickles in one sitting. That is 2-3 bags of mixes. It is a simpler process with less steps. Ball Fruit-Fresh Produce Protector prevents browning of fresh-cut produce for up to 8 hours. 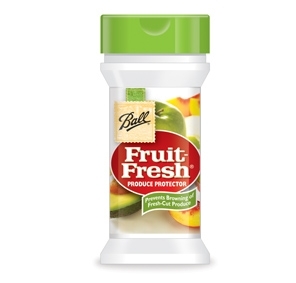 Just sprinkle on your freshly-cut fruit or veggies and protect the color and flavor of your signature creations. 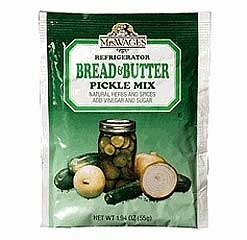 Makes the pickles crisp not limp and no bitter taste. Average canner makes about 8-12 jars of pickles in one sitting. It is a simpler crisping process not a lot of steps. Ball 100% Natural Canning and Pickling Salt contains only all natural ingredients to ensure the freshest taste and best color for your produce. 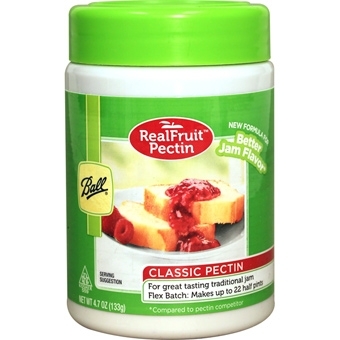 Average canner buys 3 boxes of pectin at a time. With flex-batch you make what you need and can tailor usage to fruit on-hand. No aftertaste like some diet food. 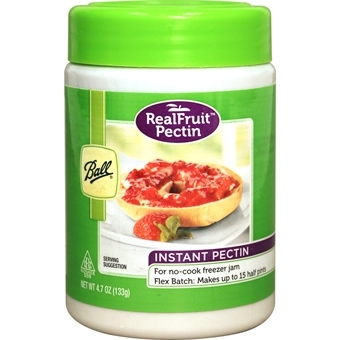 Average canner buys 3 boxes of pectin at a time. With flex-batch you make what you need and can tailor usage to fruit on-hand. Perfect for health minded people or those with dietary restrictions. Add vinegar, sugar and water to these natural herbs and spices for a great tasting pickle. 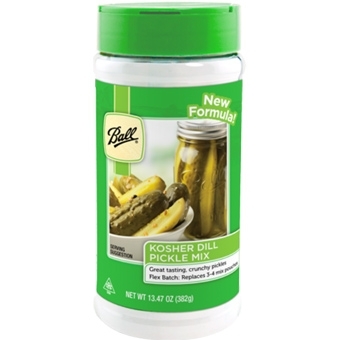 Each pack makes 4-5 pints of No-Process pickles or pickled fresh or frozen vegetables. Top selling brand of the fastest growing tomato sauce mix category on the home canning market. 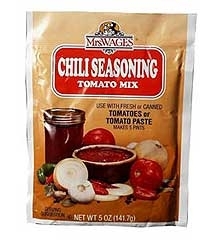 Use this mix, containing just the right spices with fresh or canned tomatoes, or tomato paste, for chili you'll be proud to call your own recipe. Makes 5 pints. Ready to eat in 24 hours after preparation. 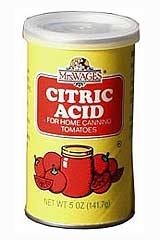 Mrs. Wages Citric Acid will increase the acidity of home canned tomatoes when prepared by the boiling water process. Contents of this package will process approximately 50 quarts of tomatoes. 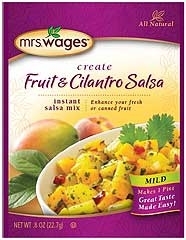 You expect high quality with Mrs. Wages products and these new pickled vegetables are no exception. Each is made with premium ingredients and absolutely no fillers. 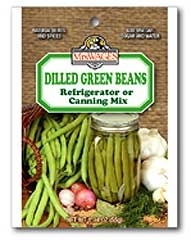 Use the canning preparation method to preserve summers bounty or take advantage of the quick refrigerator prep. 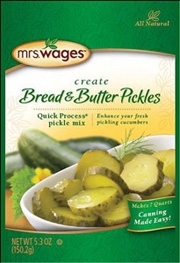 Either way, you and your family will enjoy these new pickled vegetables from Mrs. Wages. Ingredients; Salt, Maltodextrin, Spices, Natural Flavors. Top selling brand of the fastest growing tomato sauce mix category on the home canning market. 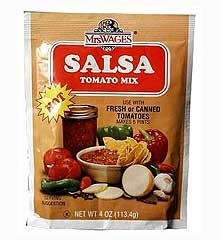 Use this mix, containing just the right spices with fresh or canned tomatoes for a salsa with a kick! Makes 5 pints and is ready to eat 24 hours after preparation. Top selling brand of the fastest growing tomato sauce mix category on the home canning market. 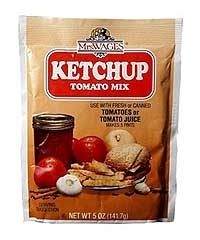 Use this mix, containing just the right spices with fresh or canned tomatoes, or tomato juice, for a mouth watering ketchup that will surely delight your family! Makes 5 pints. Ready to eat in 24 hours after preparation. Add vinegar and water to these natural herbs and spices for a great tasting pickle. 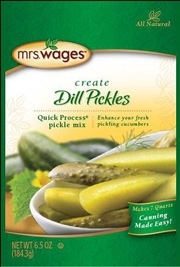 Each pack makes 4-5 pints of No-Process pickles or pickled fresh or frozen vegetables. Preserves color and flavor in fruits and prevents browning. 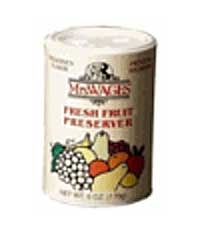 Makes light, medium or heavy syrup for freezing and canning fresh fruits. 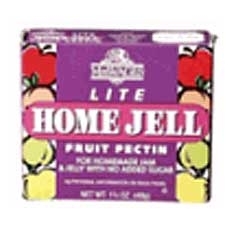 A fruit pectin used in making home-made jams and jellies. 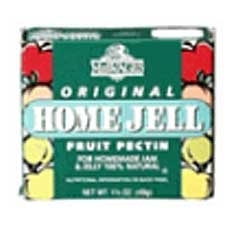 The Mrs. Wages Home-Jell and Light Home-Jell takes much of the guess work out of jelly making, and assures you of the finest results, even if this is your first attempt. 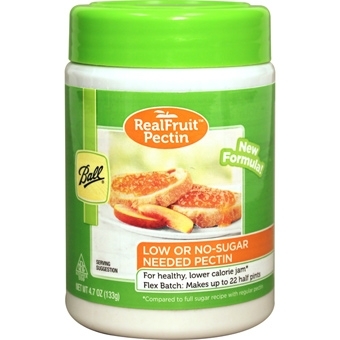 This pectin does not require sugar to jell. Non-sugar sweeteners such as Sugar Twin, Equal or Sweet-n-Low can be used with recipes for the calorie conscious or to restrict carbohydrate intake. The Mrs. Wages Home-Jell and Light Home-Jell take much of the guess work out of jelly making, and assures you of the finest results, even if this is your first attempt. 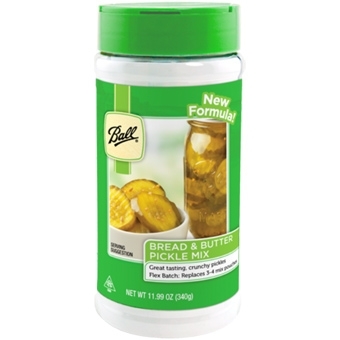 Bread N Butter pickle mix. All natural ingredients. Pickling made easy. Make delicious classic salsa using your own fresh or canned tomatoes. 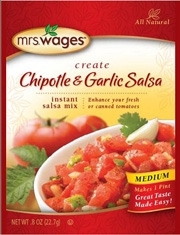 Spice up your tomatoes using all natural ingredients, you can make this delicious Chipotle &amp; Garlic salsa. Fast and easy to use. Makes 1 pint. Make delicious classic salsa using your own fresh or canned tomatoes. 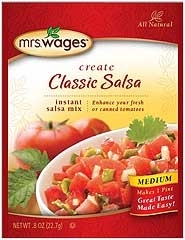 Spice up your tomatoes using all natural ingredients, you can make this delicious salsa. Fast and easy to use. Makes 1 pint. 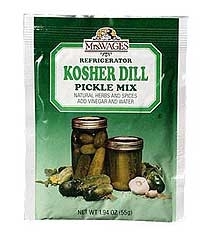 Dill Pickle mix. All natural ingredients. Pickling made easy. Make delicious classic salsa using your own fresh or canned tomatoes. Spice up your tomatoes using all natural ingredients, you can make this delicious and unique Fruit &amp; Cilantro salsa. Fast and easy to use. Makes 1 pint. Make delicious classic salsa using your own fresh or canned tomatoes. Spice up your tomatoes using all natural ingredients, you can make this delicious Habanero salsa. Fast and easy to use. Makes 1 pint. 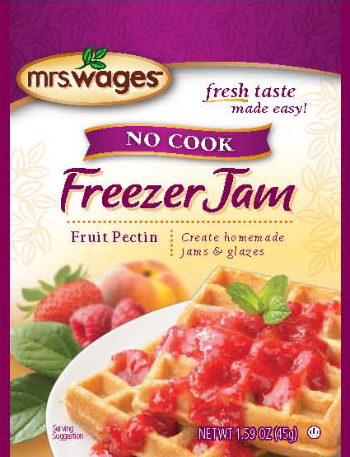 Skip the hassle of cooking your fruits and enjoy your jams and glazes instantly with Mrs Wages No Cook Freezer Jam Fruit Pectin. This new product allows consumers to make fresh fruit jams and glazes to enjoy instantly or freeze for up to one year.